Enough of my drama. This challenge was fun. I have never used coconut, partially because raw coconut makes my throat itch and I never cared much for it. Lately I have grown to love coconut ice cream, coconut milk and roasted coconut so I thought it was time to give it a try. 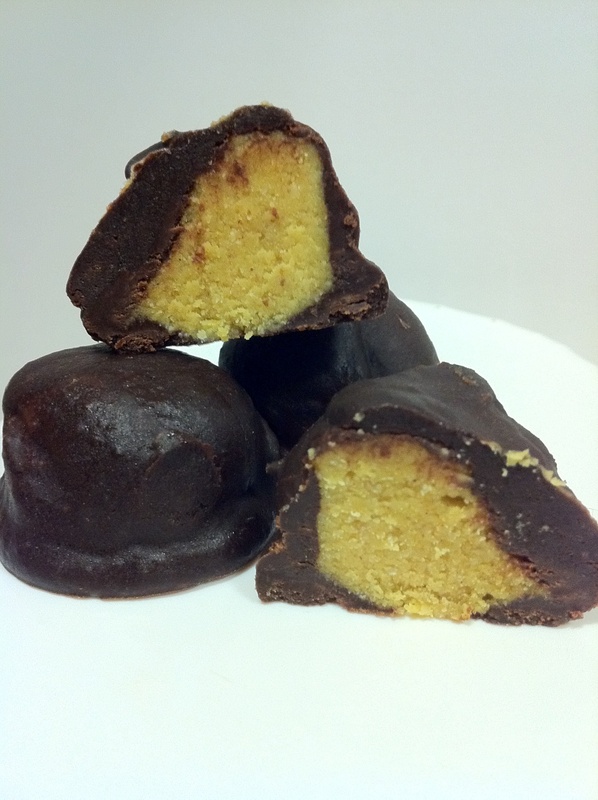 I was planning on making truffles as a part of tomorrows post anyway, so why not incorporate them? I love pumpkin chai so I was going for that flavor without the use of the tea. The almond milk with spices was amazing. If you wanted more of a coconut flavor you could substitute coconut milk for the almond milk. Preheat oven to 300 degrees. 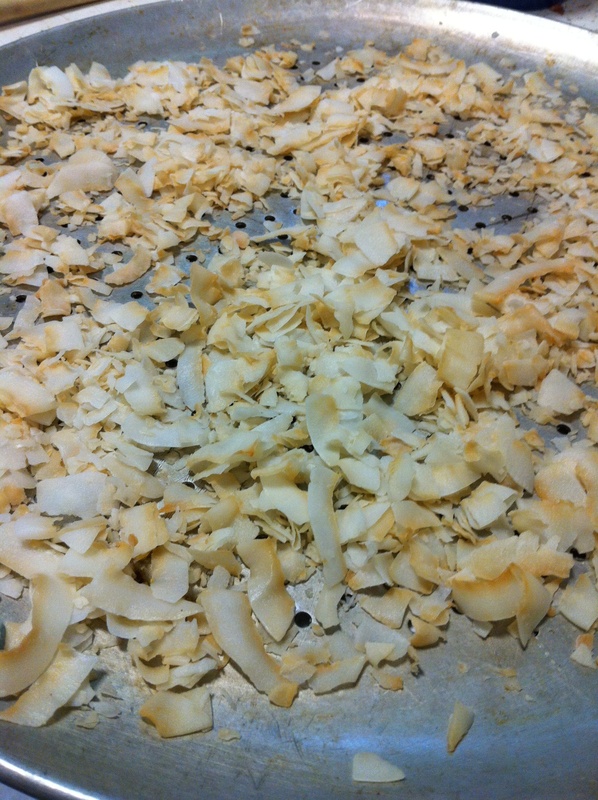 Spread coconut in thin layer on a cookie sheet. Bake for 5 minutes and check. put back in and check every couple of minutes. I read that it is easy to burn so keep an eye on it. Mine took 7 minutes. Remove from oven when it begins to brown and set aside. If you choose you could brown more than I did. To make center, put almond milk with ingredients up to pepper in a sauce pan and cook over med/low heat until milk comes to a slight boil. Remove from heat and strain milk. Put milk back in saucepan. Add white chocolate and coconut oil. Heat until white chocolate and oil are melted, stirring continuously. Put almond milk mixture, toasted coconut, pumpkin puree and dates in a blender and blend until cream. Refrigerate for one hour or until solid. You will need a cookie sheet covered with parchment paper. Once center mixture is solid begin to prepare outer layer ingredients. Melt chocolate and almond milk over low heat. Make sure to keep stirring. Once it is melted keep on low heat. Remove center mix and form a teaspoon at a time into a ball. Using a spoon drop balls into melted chocolate and roll gently until completely covered with chocolate. Remove from chocolate and place on prepared cookie sheet. Once all are done freeze for 15 minutes or until chocolate is hardened. Take out of freezer and enjoy. If you have any left overs place in a sealed container and keep them in the fridge. These look great but I cannot see pumpkin puree listed in the ingredients (although you mention it in the ‘how to make’ bit). How much pumpkin puree do I need (bearing in mind I’m in Oz and we don’t get pumpkin in cans)?